1912-1948 This swampy area was used as a dump by the city of New Orleans. 1948-1958 The dump is converted and used as a sanitary landfill. 1958-1959 The landfill is closed. 1965-�������������� The landfill is reopened to receive debris created by Hurricane Betsy; open burning of waste continued for 6 to 7 months, after which the area was covered with ash from city incinerators and compacted with bulldozers. 1976-1986 The northern portion of the site was redeveloped to support housing (390 properties are� on the site of the old landfill), small businesses, and the Morton Elementary School.� The residential properties received a relatively thin (often 6 inches or less) covering of soil; the Moton school was built upon a few feet of clean soil. 1986��������������� The EPA completed a site investigation.� Under the �old� Hazardous Ranking System, which excluded ingestion, the site did not qualify for placement on the National Priorities List (NPL). 1993 �������������� On May 4, community leaders from the Moton Elementary School area filed complaint with the Gulf Coast Tenants Organization and requested EPA to re-evaluate the site.� In September, the EPA collected additional samples for use in the revised HRS model (that reflects ingestion and a soil pathway). 1994��������������� The EPA initiated an accelerated remedial investigation integrated with removal actions.� Fieldwork was completed in May 1994, including the erection of a fence around the undeveloped area and removal of highly contaminated soils at children�s play area.� The site was proposed to the NPL on August 23, 1994.� Due to community concerns created by Superfund listing, the school board announced on August 24 that the Moton School would not open and that students would be bussed to a different school.� The site was formerly added to the NPL on December 16,1994. 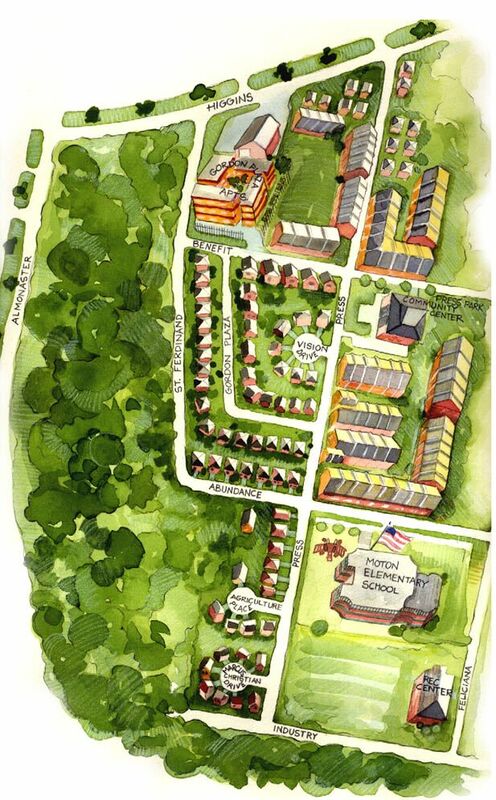 In 1967 the executive officer of the local public housing agency of New Orleans� (HANO), Robert L. Bragnac, wrote a memo to his board of directors expressing that area civic groups were excited about the possibility of constructing more public housing units.� These units were to be built on the landfill site and Mr. Bragnac recommended, �trying to obtain the junkyard as a site for public housing.� A newly formed group called the Desire Community Housing Corporation (DCHC) submitted plans to construct on the site. �Construction plans for the Gordon Plaza subdivision fell short as according to reports the DCHC were supposed to remove old landfill cover dirt and replace it with eighteen inches of clean river sand, but most of the soil was never applied in order to cut costs and increase profits for the developers (Timmons-Roberts, 2000). A program was implemented that targeted low-income African-American families for a piece of the American dream, the opportunity to own their own home.� The Mayor at the time, Dutch Morial, and other city leaders billed this development as a way for low to middle income African-Americans to have a piece of the American Dream.� It attracted African-Americans who were told that this would be the �new wave of power in New Orleans� black community.�� Proud resident began moving in, completely unaware that they were laying their foundations on a dump (Timmons-Roberts, 2000). Only shortly after the homes were sold, residents, excited about starting a new life in their first home in this new community, headed to their lawns and gardens to plants flowers and produce.� After digging only a few inches residents noticed something was unusual as they found glass in the soil, and a few started to find car parts and trash.� When one resident tried to put a fence in her yard the fencing company quit the job as their drill bit kept tearing up on what they felt was a car buried in the backyard.�� After a few years of living in the community residents grew concerned about the high rate of cancers and someone at City Hall mentioned to resident Elodia Blanco that she was living on an old city dump.�� Residents immediately began to organize and after expressing their concerns, the EPA came into the community to perform soil sample tests.� Tests on the soil were conducted and 150 contaminants, 50 of which are carcinogens, (cancer causing chemicals) were found in the soil.� Among the toxic substances found were arsenic, lead, mercury, barium, and other organic compounds that are associated with pesticides and the burning of waste. In December of 1994 when the Agriculture Street Site was put on the EPA�s National Priorities List (NPL) it became a pilot project of the Superfund Accelerated Cleanup Model (SACM) process. �Because of the expedited schedule at this site, The Agriculture Street Landfill had the shortest timeframe (three weeks after the Agriculture Street Landfill was formally proposed for listing on the NPL) from proposal on the NPL to actual ranking on the NPL of any Superfund Site in Region VI and possibly the country, (US Army Corps of Engineers).� As health investigators looked at the community they found a breast cancer cluster.� In the census tract that included the agriculture street landfill community from 1988 to 1993, breast cancers were 60 percent higher than the expected number.� There were an unusually high number of 26 breast cancers in this area (Warner, 2000).� When they looked at surrounding census tracts there were no unusually high numbers of breast cancers.� But, as often is the problem with environmental health, experts cannot trace the breast cancers to the many chemicals in the dump.� �Vincent Carradine was one of those cancer cases.� She moved to the neighborhood with her husband in 1982 and was diagnosed with cancer in 1992 after finding a lump in her breast.� She went to Charity Hospital, had a bioposy and a mastectomy two days later.� She had no family history of cancer.� But given the vagueness of the chemical problem, she says she doesn�t know where, or if, to pin the blame.� �I don�t know, I can�t say, I can�t pinpoint it,� she said.� �We ate vegetables grown in the soil here.� Could that have caused it?� But breast cancer is a worldwide disease.� They get it everywhere.� How are we supposed to know?� �(Warner, 2000). Residents of the neighborhood built on the former Agriculture Street Landfill in New Orleans meet for a weekly update on the progress of their environmental justice battle. A Clean-Up or a Cover-Up? 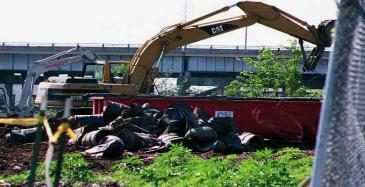 In 1997 the EPA decided on a remedial plan, which was to remove 2 feet of soil from the area surrounding residents homes.� After the soil is removed a plastic liner and a mesh liner is placed down and clean soil (sand) is placed on top of it.� It is estimated that this clean-up plan, after completed will only clean up 10 percent of the site.� Homes, sidewalks, driveways, roads and other obstructions cover the other 90 percent.� So, only soil that is directly exposed will be cleaned up as the EPA predicts that it is unlikely that the �clean� soil will be re-contaminated by the surrounding �dirty� soil regardless of the sites� low elevation and high water table. EPA contractor cleaning up the undeveloped land at the site. The request of the people here is simple.� They want to be moved out and given a chance to live on clean and solid ground.� The problem is that relocation costs are estimated to be at $12 million dollars.� But, as mentioned earlier this site is on the EPA�s National Priorities list and the Superfund site is being cleaned up.� So, is it cheaper for the government to clean up the site than to relocate residents?� The answer is a resounding NO.� In fact it has cost the EPA over $20 million dollars to clean up the site (as of 12/02/00) and the site is still under �clean-up.�� It costs almost twice of what it would have cost to move the residents out.� The EPA justifies this a few different ways.� First, the EPA claims that the money is not allocated for relocation and can be used solely for cleanup and that it would literally take an act of Congress to clean up the site.� The Congressional representative for the community, Congressman William Jefferson, has tried but failed in every effort to attain Congressional allocation of funds for relocation.� The EPA also puts responsibility of relocation on the City, who claims to be too poor to take on such an endeavor.� The U.S. Department of Housing and Urban Development (HUD), who loaned and granted the money to build the homes on the landfill, shifts the blame to all of the other agencies. 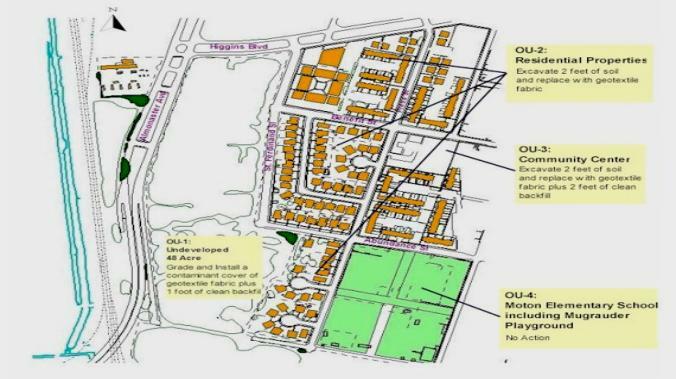 DCHC: Desire Community Housing Corporation: Contractors who built on the Agriculture Street Landfill Site. Peggy Grandpre: President of Concerned Citizens of Agriculture Street Landfill. Population:��� The 1990 Census identifies 390 residential units (some 1,000 people) on the site.� The community is predominantly (97% +) African-American, with middle-to-low income levels. Settings:�������� The 95 acre former city disposal area that has been partially redeveloped.� 47 acres of the site have private and public housing: the Press Park Community Center; a recreation center; retail businesses, and the Moton Elementary school.� The remainder of the site is undeveloped and covered by dense vegetation. As part of the environmental justice movement this community has brought the issues of �contaminated communities� to the forefront of the movement.� Their struggle took them to City Hall, to their Senators� offices and to meet with their Congressman William Jefferson.� They traveled to Washington D.C., to meet with their representatives and with HUD, with the EPA and with members of Congress concerned about environmental justice.� Elodia Blanco traveled as the neighborhood�s representative to Geneva Switzerland to testify at the United Nations (U.N.) Commission on Human Rights.� This community will continue to fight for their right to a clean and safe environment. The Agriculture Street Landfill community holds community meeting every Wednesday night at 7 p.m. in the front yard or home of a community member.� The community meetings have been essential in mobilizing, educating, and strategizing. This community networked with small groups as well as large national organizations such as Greenpeace and CHEJ (Citizens for Health Environment and Justice).� �Lois Gibbs [President of CHEJ] was essential in helping us strategize as was Ms. Williams [community leader in Escambia, Florida who was successful in getting her community relocated] as well as many many others.� (Grandpre, 2000). The community has received various forms of legal support from the Thurgood Marshall School of Law, the Earthjustice Legal Defense Fund and the Tulane Environmental Law Clinic. 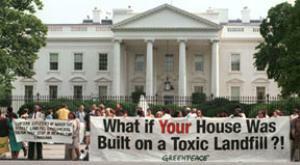 Residents of the Agriculture Street Landfill neighborhood in New Orleans protest in front of the White House. Residents' homes are built on top of soil found to contain 149 toxins, 44 of which are cancer causing. �We think the only solution to this problem is for the community to be relocated and we believe that this will happen in the court or through a Title VI complaint,� (Grandpre, 2000).� Amanda Leiker, an activist who volunteered with the community for 2 years has a message fort eh EPA and the City of New Orleans, �To the EPA: Don�t be so afraid to set a precedent.� Do what�s right (relocation) for the community, not what�s right for the bureaucrats in Washington.� To the City: Take responsibility for the City�s mistakes; it was a City of New Orleans landfill, a City of New Orleans development project, and so it is a City of New Orleans responsibility to see that these residents are relocated,� (Leiker, 2000). Rebecca Dayries, Community Outreach Coordinator at the Tulane Environmental Law Clinic states, �Apparently, after the first rain that the homes with this �new clean soil� got the settling was bad.� Residents claim that some of the sand has washed away.� The community feels that this is so political and that no agency is doing anything.� I hope someone steps up to the plate,� (Dayries, 2000). Because of residents� fears that the cleanup was extremely superficial they have not given up and will continue to fight for relocation.� Peggy Grandpre, the long time leader of the Concerned Citizens of Agriculture Street Landfill, says, �We will continue to fight.� We are going to file a Title VI complaint.� If this is not a clear cut case of Title VI, I don�t know what is.� (Grandpre, 2000). Dayries, Rebecca. (December, 5, 2000)� Interview. Community Outreach Coordinator.� Tulane Environmental Law Clinic. EPA Region 6 Agriculture Street Home Page. http://www.epa.gov/oerrpage/superfund/sites/rodsites/�� 0600646.htm. Accessed 7-27-99. EPA Record of Decision. Grandpre, Peggy. (December 3, 2000) Interview. President Concerned Citizens of Agriculture Street Landfill. Grandpre, Peggy. (2000 � to be published) Evaluations of health hazards in communities exposed to environmental toxicant.� Environmental health problems �A communities perspective. Knight, Danielle.� (April 4, 1999)� "USA: Environmental Justice Delegation Heads to UN Commission" Corporate Watch. Leiker, Amanda.� Environmental Racism and Women in Louisiana, The Pier Glass. Leiker, Amanda. Agriculture Street. Unpublished paper. National Council of Churches. (1998) NCC News Archives, African American Church Leaders Pledge Their Support to the Struggle Against Environmental Racism. New Orleans City Planning Commission, (1999) Land Use Plan "Planning District Seven "
Schleifstein, Mark. 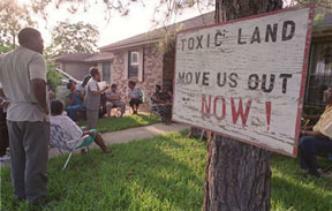 (July 10, 1999) �Ag Street residents livid over EPA ruling.� New Orleans Times-Picayune. Warner, Coleman.� (September 13, 2000)� �Residents relent on cleanup, Homeowners seek to avoid loan snags.�� The Times Picayune (New Orleans).